Today’s featured site is the El Nido Airport (IATA: ENI, ICAO: RPEN), also known as Lio Airport. This gravel-surfaced airport is located in El Nido, Palawan. Palawan is the biggest province in the Philippines by land area and its elongated shape and numerous islands scattered across Sulu Sea means that the most efficient way to go to and from its towns is by air. Palawan thus has the most number of airports of any province in the country. Many of these airports in Palawan are privately owned and are not operated by the Civil Aviation Authority of the Philippines (formerly the Air Transportation Office). 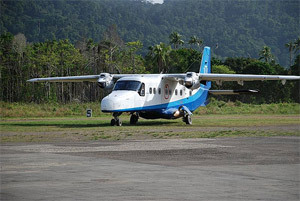 This is true for El Nido Airport, which is owned and operated by Island Transvoyager, Inc. (ITI), an airline company that operates direct flights between Manila and El Nido using a tiny fleet of Dornier 228-212 planes. They have their own hangar at the Ninoy Aquino International Airport and have daily flights to El Nido. ITI is the sister company of Ten Knots Development Corporation, the owner and operator of the famous El Nido Resorts, one of which, the Lagen Island Resort, I have featured before. Ten Knots and ITI are (I think) the biggest employers in El Nido and their aim is to commercialize the tourism industry in El Nido while protecting and conserving nature as well (Ten Knots supported the establishment of the El Nido marine protection area). If you want to take a vacation at El Nido Resorts, then ITI is your best bet because ITI and Ten Knots have an efficient transport system in place for their resorts’ guests. But if you’re not interested in their resorts and you don’t want to fly ITI, then SEAIR also has seasonal thrice-weekly flights to El Nido with a stopover at Busuanga. Of course, you can just fly to the other Palawan airports and take land transportation, or you can go by boat but those are really slow options. how much is d fare from el nido to manila via ITI? via SEAir? what are the schedules? i’m currently in roxas, palawan & would like to leave va el nido. thanks! how much is d fare from el nido to manila via ITI? via SEAir? what are the schedules? i’m currently in roxas palawan & would like to leave via el nido. thanks!